The cup of wine taken immediately after grace has been recited at the conclusion of a meal. The custom is first mentioned directly in Mish. Ber. vi 6: "If wine comes to them [a company of three or more] during the meal, each one blesses for himself; if after the meal, one blesses for all of them." In other words, wine after the meal is treated with some solemnity. In Pes. x. 1 the four cups of the Passover night are mentioned: the third of these is the cup of benediction following the grace after supper. In later times the custom arose that where one had with his meal only one unit of wine (one-fourth of a log—about the contents of an egg and a half), he should drink it after the meal as a cup of benediction; and many rabbis deemed it highly meritorious, indeed almost a duty, to have wine in readiness for this purpose at each meal, especially when three men were to partake of it, and would join in saying grace. In that case the one reciting grace aloud would take the cup in his right hand during the recital and hold sweet-smelling spices in his left (see Maimonides, "Yad," Berakot, vii. 14, 15). But the custom as to the spices has long since gone out of use. 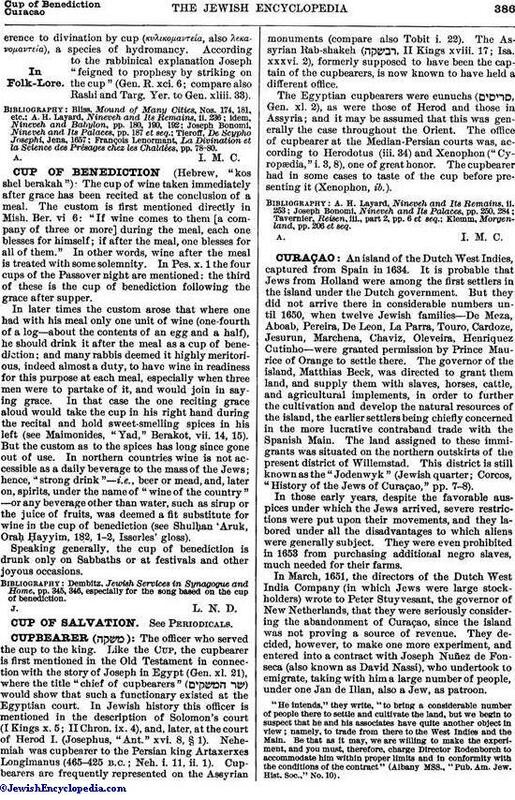 In northern countries wine is not accessible as a daily beverage to the mass of the Jews; hence, "strong drink"—i.e., beer or mead, and, later on, spirits, under the name of "wine of the country"—or any beverage other than water, such as sirup or the juice of fruits, was deemed a fit substitute for wine in the cup of benediction (see Shulḥan 'Aruk, Oraḥ Ḥayyim, 182, 1-2, Isserles' gloss). Speaking generally, the cup of benediction is drunk only on Sabbaths or at festivals and other joyous occasions. Dembitz, Jewish Services in Synagogue and Home, pp. 345, 346, especially for the song based on the cup of benediction.